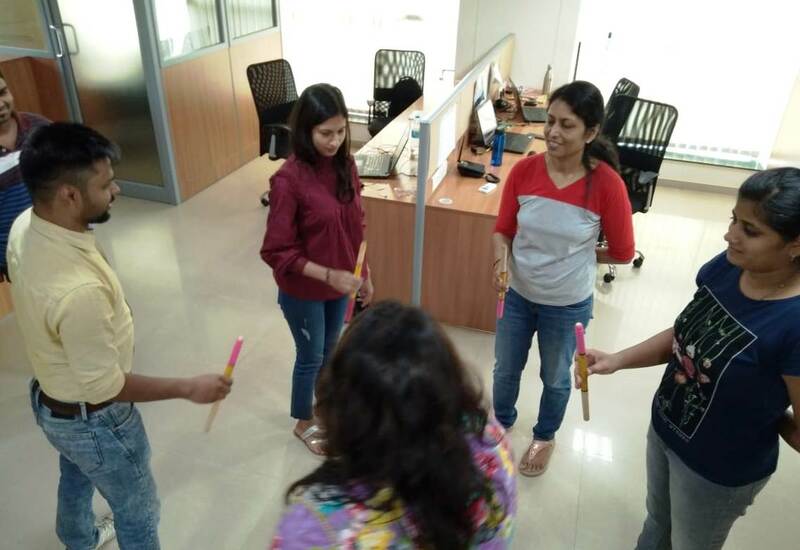 With Navaratri wrapping up last week, it did not come as a surprise that Dandiya took the center stage at MyNextHire’s Continuous Learning session. However, it came with a twist and brought forth some great lessons in working as a team. Avinash, who is our Software Engineer was the one who brought this innovative and sporty session to the team. According to his colleagues, he is a team player and hard-working fellow who loves challenges, takes initiatives and believes in quality. When he is not working, he loves to travel, go trekking and meet up with his friends. Coming back to the activity, the game plan was simple – passing the dandiya stick using one hand. 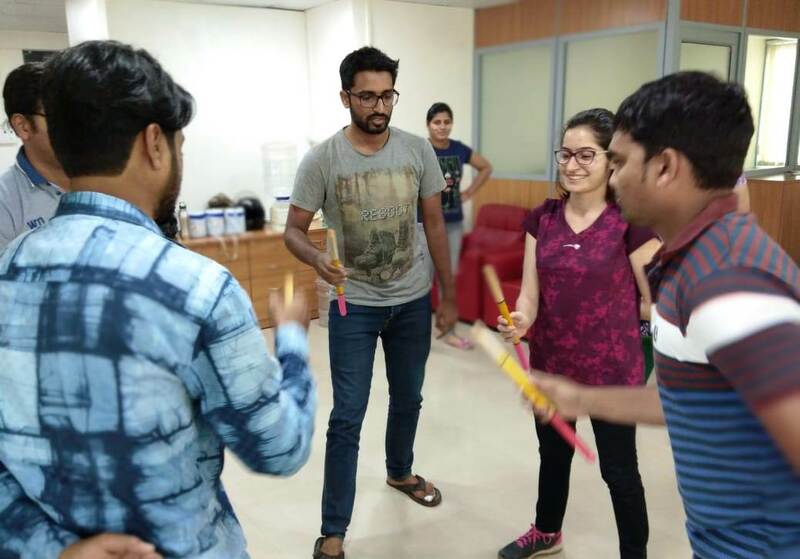 All the participants had to do was keep their left hand folded on their back and hold the dandiya stick in their right hand and pass it on to the next teammate on their right. Easy? But there was an O. Henry’s twist in the game. As each teammate passed the stick to the right, they had to catch the stick that was passed on by their teammate on the left simultaneously. Each team was given 90 seconds to play and the one with maximum passes was going to be the winner. You could almost hear the disappointment of the team like air going out of a deflated balloon. But Avinash was ready with the solution that pumped the confidence back into the team. He showed them how the impossible could be made possible and how the team could work together to achieve this feat with minimum drops and maximum passes. All they had to do was fling the stick upwards and to the right, and catch the stick coming in from the left at the same time. A little practice later the team was raring to go. The team’s enthusiasm was contagious and everyone got into planning. With childlike excitement, they divided themselves into two teams by using the “majority wins” technique that was everyone’s favorite method of creating teams as a kid. Two teams were created – Team Reboot and Team Eagle Eye. It is really interesting to know the reason behind these names. Team Reboot had decided to not to waste any time when a drop happened and to start ASAP and that is why the choice of the name “Reboot”. The story behind Eagle Eye is interesting as well. The Eagle keeps its eye focus on its prey and here the prey was the dandiya stick. There were a lot of fun moments as well as lessons. The game was a first-hand experience of how to get things done under pressure – the pressure to accumulate maximum passes and minimum drops. It was team bonding and team building to the core. There were moments of great team leadership and support. Of helping each other overcome their weakness – ask Bhanu Pratap – he was the weakest link at the start of the game and the team’s support and encouragement made him the strongest link by the time the game ended. The game also gave everyone an insight into peer pressure as one team scored well and the other had to play catch up. There were also “Arjuna and the bird’s eye” focus moments as a teammate concentrated on just the sticks. In the end, Team Reboot won as they had the maximum passes. The game was a great lesson in teamwork and a great subject for its Continuous Learning initiative. PrevPreviousThis Is How We Mastered Paper Quilling in One Day!